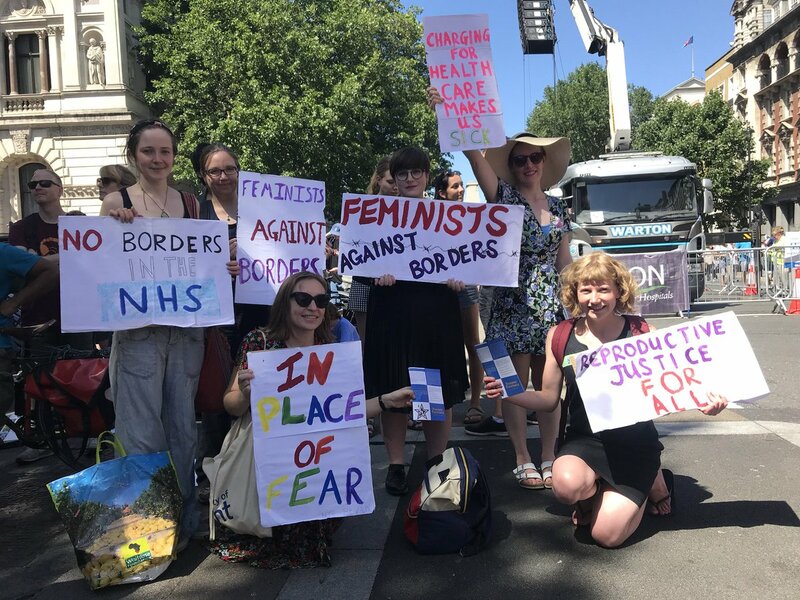 On Sunday 1st July, Feminist Fightback joined the Patients Not Passports bloc as part of the NHS 70th birthday march. With comrades from Docs not Cops and The Hackney Migrant Centre, we wanted to draw attention to the fact that as well as being under threat from privatisation, the spirit of a national health service free at the point of need is being attacked by the enactment of brutal policies which see migrants charged unaffordable amounts of money to access basic healthcare. This includes prohibitive charges for access to abortion and pregnancy services. Feminist Fightback has always fought for the rights of all to be in control of their own reproduction, which includes being enabled to have or not have children, unconstrained by the ability or not to pay for the necessary healthcare. We call for all healthcare charges for migrant people to be abolished. No borders in the NHS!